A secure fit is a major concern for denture wearers. Dentures can affect a person’s ability to speak and chew. Slippage is uncomfortable, unattractive and aggravating. That’s why more and more denture wearers are turning to implants for a secure and comfortable fit. Implant-supported dentures are also good for your overall oral health. When you lose teeth, you also start to lose the bone that once surrounded your tooth roots. This may lead to the recession of the jawbone that can change the shape of the face. Dental implants replace the lost tooth roots, which helps to preserve bone and facial structure. It is a replacement tooth root that is surgically placed in your jaw. Bone grows around and integrates with the implant surface to hold it in place. Dentures can be removable or fixed (non-removable). 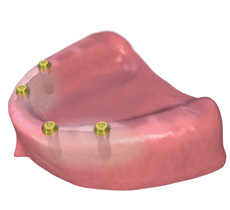 Removable dentures have “snaps” fitted into the denture itself. 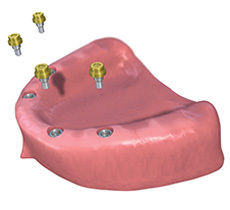 A piece called an abutment extends from the implant and snaps into the denture for a secure attachment. 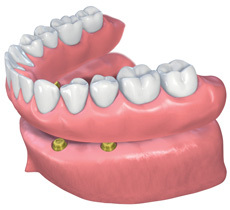 Fixed dentures are a non-removable crown and bridge, which are attached to an implant. Implants are placed surgically. Since every surgery carries potential risks, your doctor will evaluate whether dental implants are the right option for you.